There are places wherein municipal sewer systems have yet to reach. Hence in these places waste disposal is carried out with the help of a septic tank. The septic tank is a large underground holding tank connected to the house with the help of pipes. Waste exit the house through a series of pipes emanating from the bathroom, kitchen, sink, toilet etc. and converge to form one single pipe which enters the septic tank. DiamondProvides.com Septic Tank Overflow Service. On entering the septic tank the waste gets divided into three parts with the heavier particles settling at the bottom, the floating particle staying on the top and the middle portion consisting of grey water. This water is released into a drain area situated below the earth’s surface but above the water table where it gets filtered naturally and also helps to fertilise the soil. Inadequate maintenance: Due to the continuous passage of wastes into the septic tank, along with the non-biodegradable materials, some amount of solid waste also reaches the bottom of the tank. 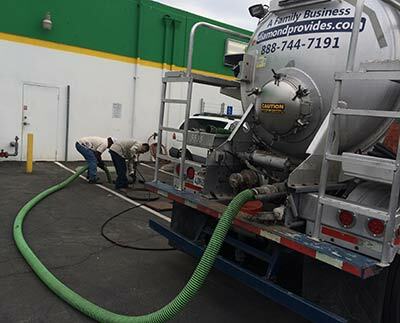 Over a period of time, the level of this sludge rises and if the tank is not pumped out regularly every 3 to 4 years to remove this sludge, the septic tank overflows. Bacterial deficiency: In the septic tank, it is the naturally present bacteria which help to break down the waste and help it to percolate into the fields nearby. Low bacteria levels tend to hamper this process resulting in a faster build-up of sludge and ultimately cause the septic tank to overflow. In fact chemicals such as bleach, detergents etc., used in the cleaning process ultimately find its way in the septic tank thereby killing the naturally present bacteria in the tank. This is one of the major contributors to the reduction in the bacterial levels inside septic tanks and care should be taken to ensure that these chemicals do not find their way into the septic tanks. Designing flaws and clogs: The exit of broken down particles along with water from the septic tank into the nearby drain field can at times result in the area becoming soggy and wet. This condition occurs as a direct result of septic tank overflow and outflow of water from broken, damaged or clogged pipes. One of the commonly seen reasons for damaged and cracked pipes is the in-growth of the roots of the trees into the pipes. A strict watch needs to be kept out for such incidents and if seen to occur should be dealt with immediately. Heavy rains: Weather conditions wherein heavy rain persists for long time can lead to septic tank overflow. This condition becomes even worse if the gutter drains directly over it. A dry spell following the heavy rains generally remedies the problem. However, it should be noted here that if these conditions result in an overflow of the septic tank, the sludge should not be pumped out. This makes the mud and other sediments to settle at the bottom thereby clogging the septic tank further. It is only during a dry spell that the septic tank needs to be pumped. There is only one effective way of dealing with a septic tank overflow; to facilitate a septic tank pump out. For this professionals who specialise in this sort of work need to be called in for inspection and subsequent pumping out. Ensure that the lid of the septic tank is tightly and properly closed after the work is over. There are other treatments also available which are also quite effective in dealing with this problem. For example biological treatments deal with the introduction of enzymes and other non-pathogenic bacteria into the septic tank in order to enhance the rate of the breakdown of the solid waste. Also care must be taken to ensure that fats, grease and cooking oils, antibacterial products etc do not enter the septic tank. Also some things like the sanitary napkin, baby swipes or even diapers should never be flushed into the toilet. Even though some are said to be flushable, any non biodegradable solid has a tendency to clog drains and result in an overflow and should thus be rightly avoided. Bad odour is a direct result of a septic tank overflow; it is also the first warning which indicates that there is a problem with the septic tank. Hence any bad odour coming out of the backyard should never ever be ignored. It can lead to disastrous circumstances if ignored.